Lets say it is rated for input power being the lesser of 10W continuous, or 30W PEP SSB. The continuous power rating implies the tolerance of components to current that heats them. 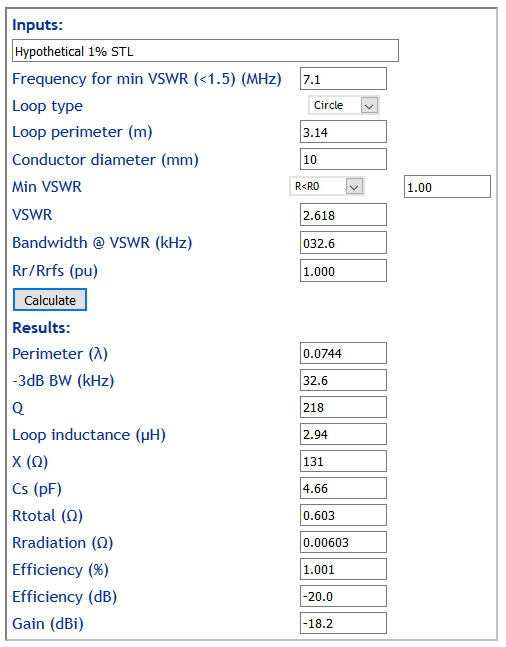 Main loop current at 10W input is given by I=(P/R)^0.5=(10/0.603)^0.5=4.07Arms. This current flows through the main loop conductor and its tuning capacitor. In poorer designs, this current often flows through spring contacts / bushings / bearings in the capacitor contributing to low efficiency. Note that common mode chokes that might be part of the configuration (on the main RF feed or on tuning motor feed), whilst not directly heated by the main loop current, also exhibit a slow response to average power. Voltage breakdown is usually a near instantaneous mechanism, and the SSB PEP rating is limited by this failure. The loop current at 25W input is given by I=(P/R)^0.5=(25/0.603)^0.5=6.44Arms. From the calculator, the main loop reactance is 131Ω, so it will tune with a capacitor of reactance -131Ω and the voltage impressed on the capacitor will be I*Xc*2^0.5=1193Vpk. The capacitor must withstand this voltage, and its dielectric loss is proportional to its voltage. Poorer designs using plastic film insulation between plates tend to exhibit high capacitor loss contributing to low overall efficiency. Main loop current and capacitor voltage are constraints on the maximum continuous and peak power respectively. 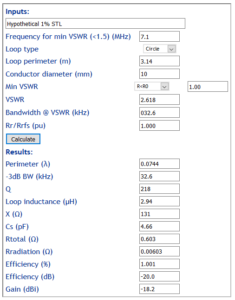 The expected values for a particular loop can easily be calculated from values returned Calculate small transmitting loop gain from bandwidth measurement. Whilst the current and voltage calculated here seem moderate and easy to accommodate, the same loop with higher efficiency (eg reduced conductor and capacitor loss) would operate at higher current and voltage.